So Philly managed to secure their own carve-out. 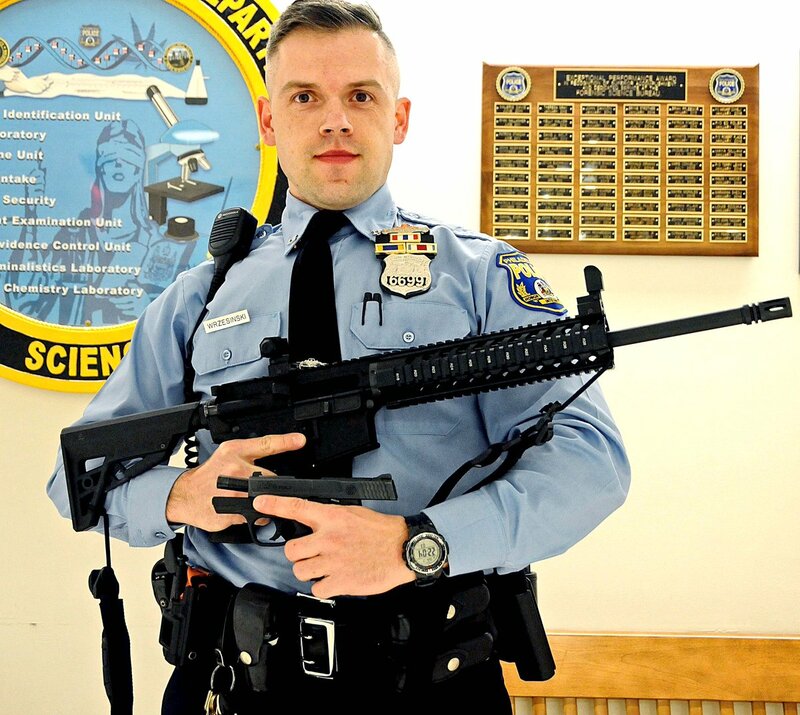 Pittsburg, apparently, is chopped liver.In any case, imagine Officer Krzysztof Wrzesinski’s surprise when he ran across an un-named 12-year-old strolling down the street in northwest Philly carrying an AR-15. He and 19-year-old Michael Mitchell, who was with him, were both arrested (Mitchell was packing a Smith M&P SHIELD without a permit). Posing like a Facebook thug - for the Philly police Facebook page! Well at least he has good trigger control. As for the 19 and 12 year old, neither was probably up to any good. Interesting. They included a charge of violating section 6106.1, no loaded firearms in a vehicle, but it says they were walking, not in a vehicle. Saw this the other night on the news and according to them the 19 year old was having some sort of dispute with a neighbor when he ordered his younger brother,the unnamed twelve year old to return to their residence and retrieve the rifle.The handgun did not belong to Mitchell. I'm not sure why the officer posed for a photo with the rifle and handgun but it's probably a good thing he arrived when he did. Last edited by Krichardson; April 10th, 2018 at 11:22 PM. I wonder if Defense Attorney Kraztner will allow this potentially dangerous individual to sign himself out of custody. It must be an AR thing. This happened about 5 minutes from my house. For those familiar with the area, Kennedy Street is a small side street adjacent to the Bridge Street exit of I-95 South. I did find it very comical that in the initial posts and tweets about the incident, PPD called the handgun a GLOCK even though the gun pictured clearly has S&W M&P Shield markings. A citizen had to correct them on Twitter.